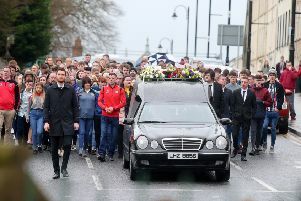 Fond tributes have been paid to the victims of a St Patrick’s Day party crush as their school friends gathered for a day of funerals. Schoolchildren formed tearful guards of honour during back-to-back funerals attended by thousands of friends and relatives on Friday. Archbishop Eamon Martin told mourners: “Words fail us at times like this. All that really matters, and makes a difference, is love and friendship and compassion. Hundreds of young people had just arrived on buses and were waiting outside the Greenvale Hotel to get into the popular nightspot. Hotel owner Michael McElhatton, 52, was arrested earlier in the week on suspicion of manslaughter and bailed to return for future questioning. A 40-year-old man remains in police custody on suspicion of manslaughter. Fr David Moore reflected at one of the funerals: “St Patrick’s Day 2019 will be called to mind as the awful day when three beautiful young people, all in the prime of their lives, were overpowered, literally in the mad rush of our modern world and needlessly lost their lives. 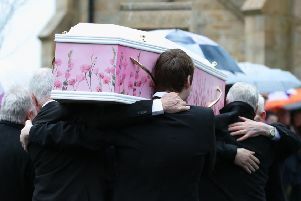 Morgan’s humour brightened people’s lives, funeral-goers heard. One friend said: “Morgan was my best friend and no matter where he is he will always be my best friend. In Donaghmore, a village a few miles from Dungannon, Lauren’s funeral was held. Her pink and white coffin was decorated with paintings of flowers. Lauren’s friends described her as having a “warm and bubbly personality with a very infectious smile”, the priest said. Her passion was cheer-leading, and team-mates from the Euphoria All Star group cut a purple streak of colour amid the drab occasion. Others wore purple ribbons in their lapels. A funeral pamphlet had a photograph of Lauren with her dog Benji on the front, her “pride and joy”. Connor was remembered by more than 1,000 at nearby St Malachy’s Church in the village of Edendork as a “courteous and appreciative” student who wanted to become an accountant. Former teammates at Edendork Gaelic Athletic Association (GAA) football club formed a tight circle around his coffin in a final tribute. His mother Ciara and father Eamon described him as a “gem”.